This is a list of glitches in the game Luigi's Mansion. This glitch occurs in the Nursery when the player picks up the ball with , faces a wall, and then presses and holds . The ball will be bouncing off the wall and back onto the grasp of the Poltergust 3000 repeatedly. This is a lighting glitch in which Luigi's shadow appears to be floating whenever lightning strikes. This glitch has been mistakenly thought to be an easter egg apparently showing that Luigi hung himself. Though this has been debunked by that fact that it appears multiple times throughout the game in awkward places. It is caused by abnormal camera angles in select situations. 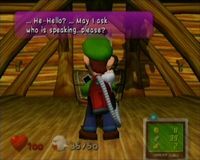 It can sometimes be seen when talking with certain Toads, as well as when speaking with Professor E. Gadd over the Game Boy Horror in any room lightning can be seen, as well as in the Telephone Room while speaking on one of the telephones. When the player comes out of the Twin's room and presses , Luigi will perform the animation used for opening doors. When the player makes Luigi face a door, Luigi's nose and part of his cap clip through the door when viewing the map on the Game Boy Horror. This glitch occurs when the player rushes to the chest containing the Area 2 Key after defeating Chauncey before it finishes spawning. It will allow Luigi to walk on the ceiling. This glitch is commonly used by speedrunners as a method to complete the game as it has the ability to take Luigi to the final boss, King Boo, very early on into the game. In order to achieve this, the payer must have side-step enabled from the starting point. After moving to the right, Luigi will run into an invisible wall. It's here that the player must press and Luigi will do a walk. Eventually, Luigi will open a door. The player must turn the light around so a Purple Bomber or Ceiling Surprise can't scare Luigi. The player will then see bats, and must make the bats notice him. Before Luigi gets hit, the player must hit down-right on . As soon as Luigi makes the "hurt" noise, the player must release . This will cause Luigi to be in a sideways angle. The player must hold right on both and , and if the angle Luigi is in is sharp enough, Luigi will go around a ledge. If Luigi's angle isn't sharp enough, he won't go around, and if that's the case, Luigi can enter a door and exit, and the bats will respawn. If down right, Luigi must then go down the hallway to the rooms including the Conservatory , while walking backwards due to some ghosts scaring Luigi. The player must then go to the left and try to vacuum some bats, but instead bring them to the right most area, and while doing so, the player must release , while quickly tapping left on and briefly holding right on all in one sequence. Luigi should have a diagonal angle once more. Switching to Standard mode, Luigi should go and face the player, along with his light. The player must re-enter Side-step, hold up on both and . The player then must pause, switch to standard mode, and hold up-right on and press to continue while pressing to open the Game Boy Horror. If done right, Luigi should fall into the wall of the hall to the Secret Altar. It's hard to see, so the player must enter First-Person View on the GBH to see. If all done right, Luigi should enter the Secret Altar and fight King Boo early. Before Chauncey, it's best to save with Toad first, as the player only has one try. It's possible to fail the Out of Bounds glitch by either releasing too late, or too early. Also, the player must vacuum and as Luigi puts the Poltergust away, Luigi must enter the wall. If Luigi walks in too early or late, he will fall into the Laundry Room. It's difficult to get the right angle by the bats. If ghosts scare Luigi, he will fall to the floor. Luigi has to be in the wall when in the hall to the Secret Altar, as it won't work if he's outside. Also, it's possible the player did the glitch wrong, and that he won't fall to the hall to the Alter when opening First-Person view. In the wall to the Altar, if Luigi walks too much to the left, a cut scene will play of King Boo blowing Luigi to the Foyer thus ruining the glitch. If Luigi walks too much to the right, he will get stuck and won't be able to move. The wall is also dark and hard to see through. It's best to bring out the Game Boy Horror. This glitch only works with the Toad on the balcony and the First floor Washroom. Luigi is able to push Toad around and once he does, if the player saves, Luigi will be teleported back to the Foyer. This glitch occurs when Luigi faces a wall just as a Shadow Bogmire is about to sucked in. The Shadow Bogmire will be stuck on the nozzle of the Poltergust 3000. The outline of the ball that was supposed to be the Shadow Bogmire is now stuck on the wall that Luigi faced. To end the glitch, the player will have to make Luigi get hurt, knock on a wall, or release . ↑ josh6250. (November 6, 2010). luigi's mansion glitch. YouTube. Retrieved May 8, 2016. ↑ NG4MER. (June 18, 2011). Luigi's Mansion Glitch - Floor 1.5. YouTube. Retrieved July 12, 2013. ↑ Scykoh. (May 1, 2014). Luigi's Mansion - Glitchfest. YouTube. Retrieved August 12, 2014. ↑ Kazooie. (February 14, 2011). Luigi's Mansion: Pushing Toad glitch. YouTube. Retrieved July 12, 2013. ↑ LucyBonesSquirrel. (August 4, 2015). Luigi's Mansion - Shadow Bogmire Clone on Poltergust(Glitch). YouTube. Retrieved April 8, 2016. ↑ Ty Anderson. (September 8, 2011). Luigi's Mansion Well Glitch. YouTube. Retrieved July 12, 2013. This page was last edited on December 28, 2018, at 21:29.